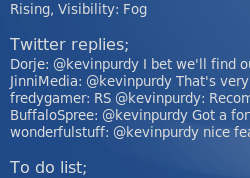 Reader Dave, inspired by our posts on the Linux desktop tool Conky, keeps tasks, weather, and even Twitter replies on hand, along with a stylish clock. Here's how you can re-create and modify his setup. Dave modified a wood-panel shot from Flickr to his own tastes; alas, neither he nor we could track down the original source (or licence terms) to give credit. 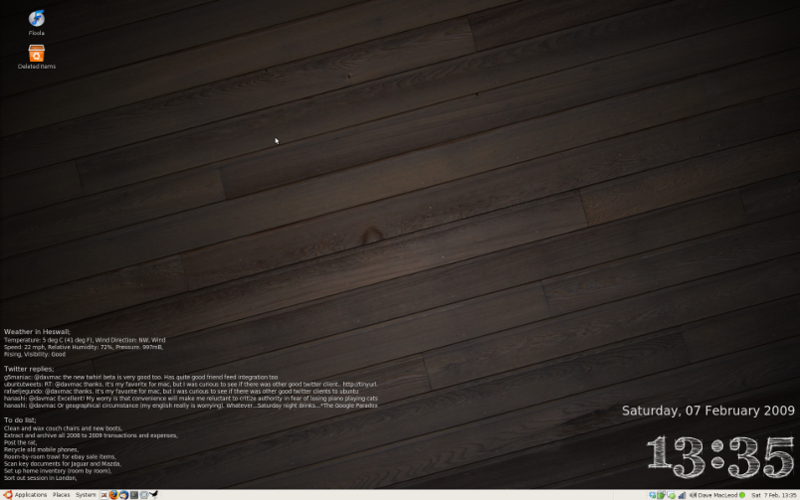 His conky setup, however, works and looks pretty great on any background, with most any theme used. Anyways, let's get down to the nuts and bolts of getting this gear on your desktop. First up, you'll need to install a few things. If you're not already using Conky, install it; it's a standard in almost every major Linux distribution, so check your package manager. Secondly, install curl, a command-line URL tool that facilitates Dave's scripts. Again, it's a pretty standard app, so most distributions should have it available in their app installers. Extract the files into a folder. Make sure you can see hidden files (Control+H or View->Show Hidden Files for Ubuntu users), then grab the .conkyrc and .conkyrc2 files and drop them in your home directory. You'll be asked to overwrite at least your default .conkyrc file; back up your default file or customised file if you'd like to, but copy both of Dave's files in. Next, create or find a folder to hold the three script files—bbcweather, rtm, and twittersearch—and put them there. Before you jump out of there, make sure to also change the @davmac bit to your own Twitter name (or kill out that entire section if you're skipping the micro-blog updates). Now head over to the three scripts you stashed away, and open up the rtm and bbcweather files. Dave explains in each file how to tweak them; the one thing I'd add is to remember to pull off the "<" and ">" brackets off the username and password sections of the rtm script. Finally, if you dig the font Dave used for his lower-right clock, you'll have to install it. It's FFF Tusj, and you can download it at dafont.com. Following the instructions at the Ubuntu wiki, you can drop that font file in one of four locations, then enter sudo fc-cache -f -v into a terminal to re-compile your font database. You can, of course, use any font you want for the clock, and the default used without FFF Tusj installed is pretty practical as well. Whew! Now that your done configuring, it's relatively simple to launch this setup. 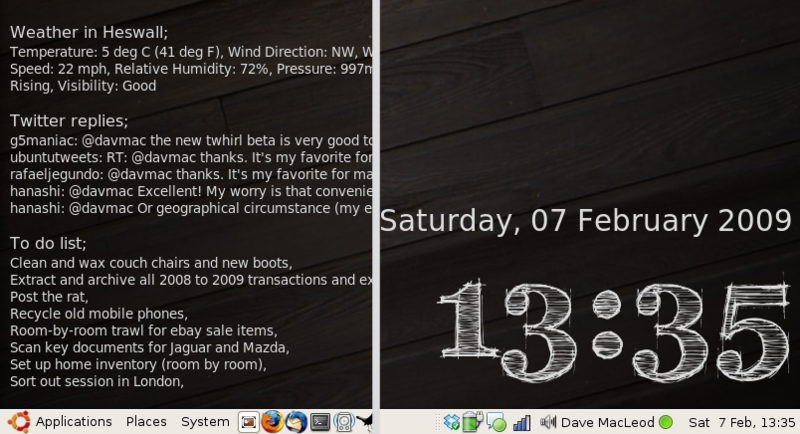 Dave uses two launch commands to get two different Conky windows going:conky for the left-hand data streams, and conky -c .conkyrc2 to manually launch and point Conky to his other, right-hand display. As Dave points out, all three of the scripts are highly configurable, since they're grabbing data that's publicly available. 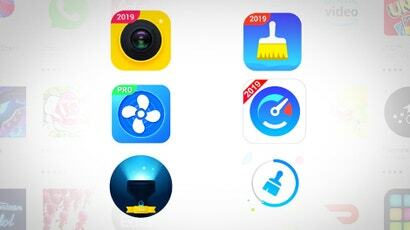 You could, for example, re-point the Remember The Milk streamer to grab your incomplete tasks from a certain list, your high-priority items tagged @car, and so on. And one could fairly easily combine these data streams with the kind seen on other Conky setups, like the Gmail and Yahoo weather icons from this beautifully minimalist setup, or the Google Calendar and current song data from our guide to customising Conky. Got a killer Conky setup of your own? Digging how Dave's scripts work on your system? Post your how-tos in the comments. Does.. that... say... post the rat?